Do you feel at home watching the second season of the Midnight, Texas TV show on NBC? As we all know, the Nielsen ratings typically play a big role in determining whether a TV show like Midnight, Texas is cancelled or renewed for season three. Unfortunately, most of us do not live in Nielsen households. Because many viewers feel frustration when their viewing habits and opinions aren’t considered, we’d like to offer you the chance to rate all of the Midnight, Texas season two episodes here. An NBC supernatural drama, Midnight, Texas stars François Arnaud, Dylan Bruce, Parisa Fitz-Henley, Arielle Kebbel, Jason Lewis, and Peter Mensah. Guest stars in the second season include Michael Harney, Mindy Sterling, Adam Langdon, Jasmine Cephas Jones, Jaime Murray, and Nick Lee. The series unfolds in the remote Texas town of Midnight, a haven for those hiding out from the world. There, only outsiders belong, while normality is just plain weird. The townies come together to form a sort of chosen family. Together they fend off external pressures from nosy police officers, vicious biker gangs, and their own dark pasts. Midnight, Texas is based on the book series of the same name, from True Blood author Charlaine Harris. What do you think? Which season two episodes of the Midnight, Texas TV series do you rate as wonderful, terrible, or somewhere between? Should NBC cancel or renew Midnight, Texas for a third season? Don’t forget to vote, and share your thoughts, below. 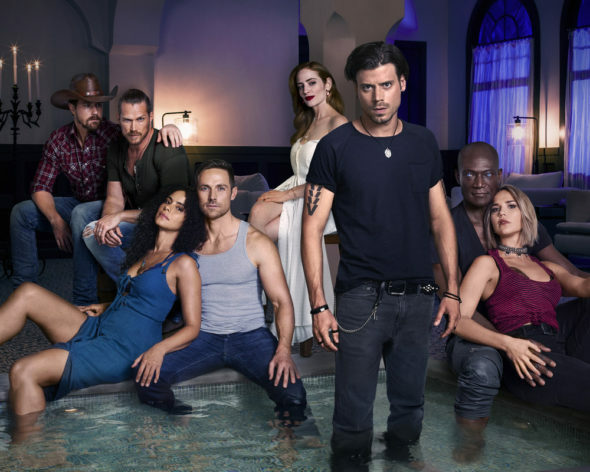 More about: Midnight Texas, Midnight Texas: canceled or renewed? Please don’t cancel this my husband and I look forward to this every week. Show is f@!&#ng great. Loved this show since the pilot. I love this show and would very much like to see a season 3, I was gutted when they cancelled Grimm as that was one of the best shows ever it comes second to my favourite show witch is Supernatural. PLEASE PLEASE PLEASE PLEASE PLEASE make a third season . I love this show, it is one of three I actually watch. Please reconsider cancelling the show. Perhaps a different air day and or time will draw more viewer’s. It is worth a shot, don’t you ageee? Such a good series; it deserves at least another series. I can’t believe they cancelled Midnight, Texas. It was my guilty pleasure, I planned my whole week around watching the newest episodes. Please, please, please bring it back for many more seasons. I would love to see a season 3. I enjoyed midnight Texas.